The Levant is old Jerusalem charm with the luxury of today, a unique home that can host up to six guests. A bedroom with twin beds or queen size and a closet with ample space for a long stay. In the lounge a TV, DVD and a couch that can sleep two guests. The lovely table by the window can seat six comfortably and can host additional guests. From the lounge there are a few steps that lead to a sleeping loft, that has a double futon and small cupboard for extra guests. A kosher kitchen with a set of meat and milk dishes. A full size oven, fridge, four gas cookers and microwave. The bathroom has a corner tub, shower option and handle for those who need extra care. There is a washing machine and a dryer. *Not suitable for children under three years of age. We have been to Israel many times but this was our first time in an apartment. We decided on the German Colony and were not disappointed. Our two week stay in The Levant in October 2016 was most enjoyable. The apartment has great character; being typical old Jerusalem with a lovely entrance (loved the beautiful door). The Levant lived up to expectations, large and airy with comfortable furnishings, and great wardrobe space. The kitchen was adequate and we ate in a number of times. If we have one negative comment, it would be that the bathroom was looking a little “tired”. The location is wonderful - set back from Emek Refaim Street so you are off the main thoroughfare, yet two minutes from supermarket, shops, restaurants and bus stops. We loved the hustle and bustle of Emek Refaim, and equally the more peaceful walk along the converted railway track at the rear of the apartment. The best of both worlds! Linda was just a phone call or email away for any minor issues or queries, always friendly and helpful. We hope to have the opportunity to make a return visit. Linda came to my rescue after I was terribly dissatisfied with an Airbnb apt I had originally booked. The Levant was perfect for me! Bright, airy, clean, big, kitchen complete. Only two small problems: stove stopped working properly after about two/2 days but it wasn't a major issue; the TV remote and I were not harmonious but it was 'fixed'. I would definitely use Colony Suites and Linda again, and if alone, would want The Levant again. Thank you, Linda! We stayed in the Levant apartment May 29-26 2016. Great place to stay for short or long stay. We loved the area and parking was not a problem for us as there was heaps of free parking about 5 minutes walk. The apartment was clean and very modern. We stayed in Colony Suite's Levant apartment for the second time. It's a lovely apartment that is spacious and comfortable for our family of four. It is well-equipped with attention to details such as the provision of umbrellas, a safe and a drying rack. (My only suggestion is to provide a radio and/or ihome device for docking an iPod.) The location is ideal - close to the old city, readily accessibly by bus lines and in the heart of the thriving German colony neighborhood. We could go out each morning to get fresh bagels for breakfast and there are a wide variety of restaurants in close proximity as well. There are two grocery stores within a five-minute walk from the apartment. Overall, we felt like we were coming home (after having stayed here 3 years ago) and we were pleasantly surprised to find a few upgrades to the apartment since our last visit. We have recommended this apartment to friends and will definitely stay here anytime we are visiting Jerusalem. This is a very comfortable and functional apartment in the heart of a village throbbing with life. Cafes and restaurants abound, and there are at least two synagogues nearby. Though a little out of the way, a longish walk or short bus ride takes you to the Old City, Mamilla, and Ben Yehuda street. But the best thing about this apartment is its manager, Linda. Not only did she make sure everything in the apartment was in working order; she also went out of her way to help us with restaurants, bus routes, sheruts--you name it. Thank you, Linda! Leora and David are great hosts. They have several nice, small/medium size apartments in the wonderful German Colony neighborhood, only steps off Emek Refayim Street, with lots of shops, cafes, grocery stores and bus. Their apartments are modern, clean, stylish and the location is great. There is a washing machine in most, and couch/hideabed for extra people. Short bus ride or 20-30 min walk to downtown or the Old city. They have weekly cleaners that do a nice job keeping things fresh. Parking can be a bit of a challenge, as in all of Jerusalem, but you can always find a spot within 2 blocks. We definitely recommend them and their apartments. Our stay in Colony Suites "Levant" apartment was every bit as great as we anticipated. It truly is just like the photos...and the neighbors are kind and friendly. What is not shown in the photo are the tall trees bordering the property which provide privacy and shade between the buildings. The neighboring garden is a visual delight in this city where garden space is a premium. Linda and the owner were pleasant and sensitive to our needs. 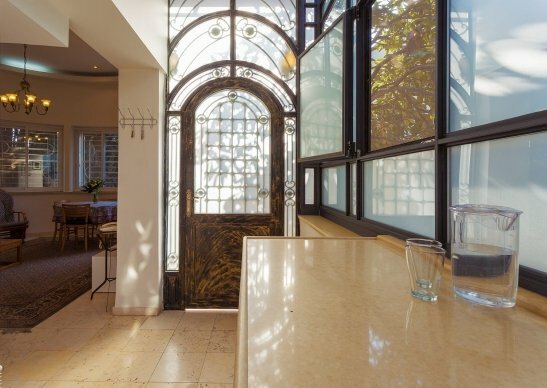 We highly recommend this property to anyone planning an extended stay in Jerusalem. I was welcomed so nicely by Linda. She was ever so helpful! Great location, very close to Emek Refayim shops, bus stop and restaurants. Clean, great kitchen and living/sleeping areas, light-filled. This rental was a completed success due to its convenient location (easy, pleasant walk to Hartman Insitute and other German Colony offerings) it's very lovely amenities, great support from management, and general delightful mess. We recently spent two weeks in Israel with our home base being Jerusalem. A friend had recommended Colony Suites since she had stayed there the previous year. We couldn't have been more comfortable or happier to have chosen the Levant. The bedroom was spacious with a good amount of closet space; the living room was light and airy. We ate all our breakfasts and several lunches there because the kitchen was so user friendly. The apartment was immaculate. Emek Refaim, the location, couldn't have been better. Step outside and you have restaurants, food markets and synagogues within walking distance. Buses are right outside the front door and it's easy to get around the city. A wonderful choice for a magnificent stay in Jerusalem.